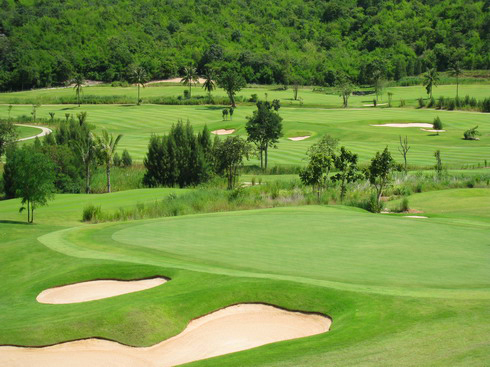 Nestled on the hillside of Southern Hua Hin and set within a pineapple plantation, Banyan Golf Course features some magnificent views of the mountain ranges surrounding the fairways and even the ocean. 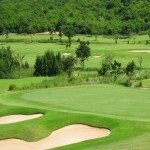 A delight for every golfer, Banyan offers one of the best course layouts in the greater Hua Hin area. With six tee boxes on each hole, golfers can select the kind of challenge matching their skill level in the same way the strategically placed bunkers, sand traps and water hazards do. The signature hole #15 offers magnificent sea views and is a 139 yard par-3 while the 12th hole is arguably the most challenging with a total of 610 yards par-5, all uphill. Banyan golf club’s facilities offer a variety of facilities including driving range, two large putting and chipping greens to improve your skillset. The clubhouse features reception area, fully stocked pro shop as well as stylish locker rooms. Restaurant, Spa suites and a pub with views across the mountain ranges invite for some down time after the game. 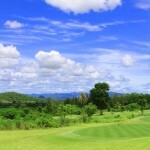 The Banyan resort is located a short drive away and is an ideal starting point for your golf vacation. With the development boom from 2005, many developments started around the southern end of Hua Hin. The opening of Banyan Golf Club greatly contributed to this area now being one of the foremost residential neighbourhoods for expats. Several smaller estates offer privacy and spacious homes, most of which feature private or communal swimming pool set on sizeable land plots. There are various resale opportunities in the vicinity of Banyan Golf Club, most of them a mere 10-minute drive away from the course. New developments are being constructed within closer proximity already destined to be the next expat community of Hua Hin.